Last week's Land Rover Defender was a bit too pretty, so why don't we come back to Earth this week with an old Chevy Malibu that tells a story? Picture the world like this: it's 1981, Reagan is President, and Saddam Hussein is an old friend, an ally who we are selling weapons to use in order to defeat Iran, who we are also selling weapons to, in order to defeat Iraq. 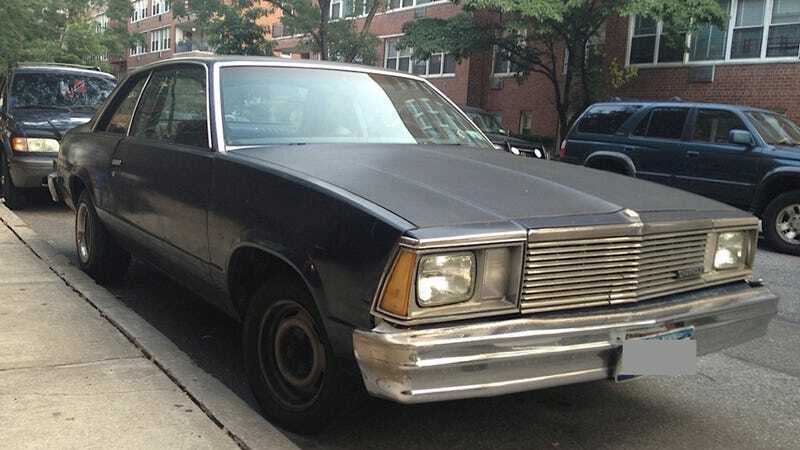 Oh, and the Chevrolet Malibu, like the two-door pictured here, is available in coupe, sedan, and station wagon body styles. Engines ranged from a 110 horsepower V6 all the way up to an earth-moving V8 with 170 horsepower. How they got so little horsepower out of such a large engine I'll never know, but it was the Malaise Era and the world was still recovering from the Oil Crisis. But back to the Middle East. Saddam is fighting his big war with the Ayatollah, and what do you need most when you're fighting a bloody war to a stalemate? That's right. In 1981, the Iraqi government placed an order for 25,000 Chevy Malibus to be used as taxis from General Motors Canada. The special-order taxis came with the weakest V6 mated to a unique three-speed manual mounted on the floor. All the taxis came with air conditioning and heavy-duty cooling as well, because it's the desert and the desert is hot, in case you didn't know. GM shipped 13,000 of the things before Iraq suddenly pulled out of the deal, leaving over 12,000 Chevy Malibus custom-built for the desert sitting on the dock in Halifax, Nova Scotia, which is not a desert. Iraq claimed it was because of quality issues, and considering what GM was cranking out back then it's not far-fetched. In reality, though, it was probably because paying for a war and placing special orders for taxis at the same time doesn't make much sense. The Malibus continued to languish in port until GM finally realized that no, Iraq was probably never going to take delivery of its taxis. Eventually they were all sold off to the Canadian public at a greatly reduced price, probably because no one needs a desert-ified Chevy in a place that has no deserts. Also, I hear it gets cold there. The "Iraqibu" can still be found prowling Canadian streets today, and they are a bit of a rarity. This one I found is not a special Iraqibu, but hey, it's a neat story.